Gurgaon’s advantage as an IT destination might dwindle in the coming years and its growth stunted if it does not continue to find relevance with the corporate requirements. There are some areas which need immediate attention and development,foremost among them being infrastructure and power. Increasing cost of living and rising rentals,lack of proper public transportation and of course safety and security concerns in the city are proving to be other deterrents for both companies as well as residents. These pitfalls need to be taken care of on an urgent basis for Gurgaon to be in good books for all in the long run. The city needs to get its act together else it will blunt its competitive edge.There are many smaller cities that are now wooing corporates with the cost advantage and new and better infrastructure. The cost of moving offices to the newer hubs is very low and can soon threaten Gurgaon’s very existence.Indore in Madhya Pradesh and closer to home, Noida and Greater Noida are also being developed and pitched as lucrative IT destinations.The emphasis on infrastructure in these cities is a lot stronger. And if things need to continue at the same pace, Gurgaons ranking as a number one IT destination in North India might be threatened. Gurgaon needs to scale up and make its infrastructure support and other civic facilities more robust if it looks to enduring as an IT hub of choice. The ability to transform and adapt is the only sustainable competitive edge. honchos, representatives of RWAs and planners on Friday came together to discuss burning issues facing the city. Infrastructure, environmental sustainability, healthcare, disaster management plan and educational facilities figured in the discussion. Many corporates have been undertaking service projects in various parts of the city. Sunil Dahiya, managing director of Vigneswara Developers, revealed that his firm is building 3,000 affordable housing units in Manesar for labourers. Cdr Udaybir Yadav, deputy general manager, Raheja Developers, talked about his firm’s initiative to provide free education and meals to underprivileged children at its four construction sites. A lot of time was spent discussing on how to conserve water as the city already faces a water crisis. Huda administrator Praveen Kumar talked about rampant misuse of potable water. “We need to check wastage of water by improving the regulatory mechanisms,” he said. To conserve water at micro and macro levels, general manager of ITC Hotels Niranjan Khatri suggested practices such as using water-saving devices and solar panels. Kumar also stated plans to build 2,200 housing units for the economically weaker sections, installation of 1,000 mobile public toilets and plantation of two crore trees in the next six months. He also discussed a proposal to develop a nearly 2.5-kilometre stretch of Mehrauli-Gurgaon Road (from Sikanderpur Chowk to Iffco Chowk) as a walkway. The stakeholders of the Delhi-Gurgaon expressway have identified points to set up facilities such as cloverleaves, underpasses and flyovers. The Haryana Urban Development Authority (Huda) on Friday urged residents to help curb misuse of groundwater in the city. Citing shortage of manpower in the department, Huda administrator Praveen Kumar sought support from Resident Welfare Associations (RWAs). "Please ask residents to volunteer from different localities and collect data on submersible pumps. Once we have the information, I will ensure they all are metered or regularised." Kumar also said that the Huda will have a dedicated wing for water management in the city that will address issues such as availability of potable water, recycling of sewerage water, checking the misuse of water and regularising borewells. GURGAON: Even before the Mass Rapid Transit System (MRTS) on Gurgaon-Manesar-Bawal corridor takes off, a plan has been floated to extend it to Neemrana in Rajasthan. This was disclosed by a senior functionary of Delhi Mumbai Industrial Corridor Development Corporation Limited (DMICDC) at a national conference on port infrastructure in the capital. The official said that the MRTS corridor would provide direct connectivity from Delhi international airport to Neemrana industrial area which is emerging as a major investment destination. Many Japanese investors have shown interest in the industrial belt that is coming up as a hub of IT/ITes, automobile and tech industries. We want to improve the connectivity along the stretch to push the economic activities. In the first phase of MRTS, we will connect Gurgaon, Manesar and Bawal, he said. The MRTS is likely to take off from Haryana border near Dwarka, and follow the northern and southern peripheral roads. It will thereafter move along IMT Manesar, up to the Orbital Rail Corridor onto the Panchgaon Chowk and then run along the NH-8 till its terminus at Bawal. Sources in the Haryana State Industrial and Infrastructure Development Corporation (HSIIDC) said that at a high level meeting held last year it was decided that a metro rail line (on the lines of Delhi Metro) would be laid along the alignment of the northern and southern peripheral roads. The exiting metro rail currently is planned till Rajeev Chowk in phase-IV, which the officials say would be extended till Panchgaon Chowk. From there, a suburban rail system could connect Bawal, as proposed by the DMIC (MBIR) consultant. The project has already received the approval of Cabinet sub-committee which has directed the HSIIDC to take further requisite action, including acquisition of land and mode of implementation of the project on PPP basis. Areport says that about 200 million sq ft of space is required for various real estate development projects in the NCR. And, within the NCR, Gurgaon leads all the other cities in the demand for space for residential, office, retail, and hospitality sectors. Gurgaon is close to the Indira Gandhi International Airport and boasts of good connectivity to all the other cities in the NCR, as well as to cities in Rajasthan, Haryana and Punjab. This has given a fillip to the development of Gurgaon as the most prominent outsourcing and off-shoring hubs in the country. In fact, leading auto companies like Maruti Suzuki and Hero Honda set up their manufacturing base in the city only because of the high potential and ample land space to accommodate their huge plants. "The area along the NPR (National Peripheral Region) holds a great potential in terms of investment due to its proximity to the airport and Delhi, and of course,its excellent connectivity . The place will also get posher once the proposed second diplomatic enclavecomes up in Dwarka's Phase 2, bordering Gurgaon, as it will become a hub of all the major embassies. Thus, investing in this region makes a lot of sense," says Navin M Raheja, the chairman and managing director of Raheja Developers Ltd. Gurgaon has caught the fancy of most of the developers . The multi-directional developments in terms of infrastructural and commercial activities have promoted the residential segment, which ranges from affordable to highend units, lowrise to highrise houses, tall condominiums to huge penthouses and villas. The BPO and IT revolution in the area has supported high purchasing power. Some of the sectors like Sectors 80, 81, 82, 85, 86, 90, 9, 92, 93 and 95 are seeing a tremendous response. Proximity of these areas to the Dwarka-Gurgaon Link Expressway, which will help the residents here bypass the traffic at Gurgaon toll bridge near Delhi during peak hours, is an added incentive. Sector 84, one of the new sectors around NH-8 and a part of the Gurgaon Master Plan 2021, has among the widest roads in the region. Orris Infrastructure has more than 1,200 acres as land bank, which has helped in its successful launch of premium commercial and residential spaces. Orris's land bank is located in Sectors 82A, 83, 85, 88, 89, 90 & 93. Innovative Developers has Legend Heights, a commercial project with three lakh square feet of prime commercial space in twin towers. It is strategically located in Sector 80 on the intersection of a 270-metre- wide new proposed 12-lane expressway, the NH-8 , and a new proposed 84-metre-wide sector road.This is a mixed-use development which will include Grade A office space, an international upscale 140-room Hyatt hotel, and house world-class retail facilities. Sumit Khanna, the managing director of Unimexx Builders and Developers, says: "Gurgaon has become a preferred city for thousands of professionals who are buying apartments and going in for other housing options here. Realizing the potential demand from NRIs and well-heeled customers , who consider it worth spending on luxury and highend facilities, premium residential projects have also sprouted in the city." Dr S P Yadav, a famous urologist who runs Pushpanjali Hospital in Sector 15, says: "Gurgaon has gained a prime position in the development of Haryana, in the last two decades. As the city of Gurgaon grew and expanded its boundaries, newer areas needed to be brought under the development umbrella. The new upcoming sectors in Gurgaon encompass the region surrounding the under-construction Dwarka-Gurgaon Expressway (also called the Northern Peripheral Road). Most of these sectors are approved for group housing projects, with a handful of commercial projects also approved for development. The two main clusters are along the upcoming Dwarka-Gurgaon Expressway in New Gurgaon's Sectors 102 to 113 and Sectors 76 to 95 along the NH-8 connecting Gurgaon to Manesar. Both these clusters were predominantly marketed as affordable and mid-income housing catchments. A host of projects were launched in these locations over 2009 and 2010. The peak of these areas' popularity was in mid-2010; however, as with most developments, a generic price rise of between 15-20% dampened demand with price-sensitive buyers. Though still favoured by budget home seekers, these areas have also seen recent launches in the premium segment by bigger developers like Sobha, ATS and Puri Constructions. This phenomenon has attracted HNI buyers and investors who are looking for capital appreciation opportunities. In comparison to projects in the Dwarka-Gurgaon Expressway precinct, the developments along the NH-8 – spanning sectors 76 to 95 – are selling at lower price points. Connectivity to these areas is expected to improve further with the development of the Northern Peripheral Road and the arterial sector roads. Sector-114, which lies near the upcoming Dwarka Expressway, is designated for commercial use. Due to its proximity to Delhi and the airport, commercial development here is expected to witness good demand levels. However, the demand for commercial office space would depend on the completion of the Dwarka Expressway, the internal sector roads and other infrastructure improvements. Currently, connectivity is through a 24-meter sector road. Demand for commercial office properties in this part of Gurgaon is likely to pick up over the next 3-5 years, when certain projects will show visible signs of construction progress and this will provide a clearer vision of the completion timelines for the Dwarka Expressway. Apart from its proximity to the airport, this region will also benefit from the planned Metro connectivity, which will further fuel demand for office space. However, the, bottom line remains that only complete clarity on the timelines for the infrastructure developments in this part of New Gurgaon will finally boost commercial office space demand in this sector. Its proximity to Delhi and the development of the Expressway and the Metro will definitely prove advantageous to this sector over the medium to long term. Most of residential demand for mid-segment housing is concentrated around the upcoming residential corridors around the Northern Peripheral Road and other sectors around NH-8. Prices in these projects have appreciated steadily over the second half of 2010 and the whole of 2011. This is an indicator of the healthy demand in these clusters. The Southern Peripheral Road is close to the established residential corridor of Sohna Road. A host of residential projects have been launched here by Unitech, Tata Housing, Today's Group, BPTP and Tulip, among others. Residential prices on the Southern Peripheral Road are closer to those of projects on Sohna Road and vary between Rs. 4600-7200/sq.ft. Both these upcoming residential corridors in Gurgaon offer a host of options by reputed developers, at and prices which allow for a potential capital appreciation. 1. The support infrastructure – specifically the arterial and sector roads, traffic management, civic services, etc. Also still to be demonstrated is the ability of the civic authorities to create and maintain infrastructure which will be able to sustain the pressure of a sizable addition to the population over the next 4-5 years. Physical infrastructure like roads, power and sewage disposal are developing at a slower pace than what working at optimum capacity would deliver. The road infrastructure, in particular, has struggled to cope with the increase in vehicular traffic. Gurgaon has been plagued with inadequate power generation; with power requirements increasing rapidly, concrete steps need to be taken in this regard. In short, infrastructure development in Gurgaon has definitely not kept pace with the speed of real estate development. The Millennium City is already challenged in providing the right quality of life to its citizens, and the upcoming developments there are going to exert further pressure even as capacity building remains at sub-par levels. Gurgaon, January 28, 2012In almost one year from now, India’s first private metro rail will start running on a 6.1-km elevated track, connecting offices of multinational companies, swanky shopping malls and up-market residential complexes. real estate major DLF Limited, will not only boost the local transport system but will also serve as a robust feeder system for the existing Metro line. Likely to start operations by early 2013, the track will have six stations. Equipped with an automatic train operation (ATO) system — which means no driver will be required to run it — it will integrate with Delhi Metro’s network at the Sikanderpur station. Apart from the rapid Metro, several other private initiatives — including a proposed Rs 5,000-crore pod taxi system — have been taken up to improve the mobility of people in the absence of a public transport system. Tuk Tuk autorickshaws, a round-the-clock auto service, all-women pink autos will be available at all Metro stations, 35 radio autos a phone call away, battery-operated rickshaws and smart ride shuttle bus service for cybercity executives and residents of DLF are some initiatives. the spectacle of concrete girders being laid along the Gurgaon Expressway and in DLF Cybercity. The good news is that 18 such girders (also called viaducts) out of a total of 284 have already been set up. These are single-piece girders unlike the DMRC's 10-piece ones, laid on the Gurgaon line. The promoters claimed that these girders being one-piece structure not only presented better aesthetics in tune with the city's skyline, but the setting of such structures was much faster. "The girders which are precast at the casting yards are 25-meter single-piece structures as against 10-piece girders used on the DMRC metro line." "Such structure not only provides better finish, it hardly takes two hours to set up the pillars compared to 3-4 days in the conventional method," said the spokesperson of Rapid Metro Rail Gurgaon Limited (RMGL). As per the detailed project report, the 6.1-km RMG project to come up on the elevated track, will have six stations and will start from near DMRC's Sikanderpur Metro station and make a loop in the DLF City II to terminate at the same place. The first girder was launched on August 9. RMGL consultant Survesh Tiwari said the company targeted to launch two girders a day after the monsoon gets over. "The movement of girders starts at midnight from the casting yard. These are set during the early morning hours when the movement of traffic is minimal," he added. facilities open up several real estate possibilities. then, prices in the area have zoomed. Now there is plan to extend the metro further towards Greater Noida. Faridabad lie has pushed many infrastructure projects. stretches 15 km on either side. GURGAON: With the log jam on revenue sharing between Haryana Urban Development Authority (HUDA) and DLF Ltd coming to an end, the plans for overhaul of the 9.5-kilometre road connecting Shankar Chowk to Sector 55/56 via Cyber City and DLF Phase-I have been reworked. The earlier plans have been reviewed keeping in mind the growth in traffic expected in the coming years. The project also focuses on the development of a comprehensive drainage system as the roads get flooded every time it rains in the city. Among the major changes in the plan is a proposal to construct an underpass between Sikanderpur and MG Road towards IFFCO Chowk. This replaces the earlier plan to construct both a flyover and an underpass on this stretch. "With Metro structures already existing in this area, construction of a flyover would have been a challenging task. Hence, construction of a long underpass is being advised," said a person close to the developments. Also, the earlier proposal for two-leaf flyovers at Sector 26-A/27 crossing and Sector 42/43 junction leaving scope for the future Metro work on the median has now been changed into a six-lane bi-directional flyover leaving scope for the Metro construction along the pavements. "The new flyover has been proposed to cater for traffic in 2031 and beyond…" says the detailed project report (DPR). The plan also proposes widening of the road near Sikanderpur Chowk, Gateway Tower, and all internal roads, among others. The current final plan for the project corridor includes a unidirectional flyover at Sikanderpur and a bi-directional one at Sector 42/43 junction. It also includes a unidirectional underpass near Gateway Tower and a bi-directional underpass at Sikanderpur. The project lays special emphasis on the congested Sikanderpur crossing which has regular traffic snarls, especially during the peak hours. The plan also leaves scope for future widening of the roads and service lanes along most parts of this stretch. The project envisages development of flexible pavements for the new carriageway and repairing of existing pavements. "The pavement width on existing 4-lane carriageways has been designed…" says the DPR. On the other hand, Rapid Metro Rail Gurgaon Ltd (RMGL) has submitted its feasibility study for the second phase of Metro link between Sikanderpur/Bristol Chowk up to the Golf Course Road and Sourthern Peripheral Road (SPR) intersection recently. The 6.5-km stretch of the private metro is expected to come up by 2015 at an estimated cost of Rs 2,143 crore as per the report submitted to HUDA. the country – is planning to augment the capacity of the existing toll plazas. "We are keenly exploring the possibility of increasing the number of lanes at the toll plazas to 50 from the existing 32," said a NHAI official. This would go a long way in reducing the traffic snarls that have become a regular feature on the expressway, which sees a daily flow of over 1.7 lakh passenger cars through the toll plaza. As and when the toll lanes on the Delhi-Gurgaon expressway are expanded to 50 lanes, it would become one of the largest toll plazas in the country. "We are appointing a consultant who will recommend specific measures to decongest the Delhi-Gurgaon expressway and suggest ways to augment the capacity of the existing toll plaza," said a senior NHAI official. The consultants would be suggesting both short term and long-term measures to decongest the stretch. "Increase the number of toll lanes should not be a problem as there is land available on both side," said the official. the decongestion plan," the official added. NHAI officials said that the urgency to decongest the expressway was necessitated on account of the growing traffic on the stretch. "The traffic flow is expected to increase further in coming years. And if adequate measures are not taken now, there would be chaos," said a NHAI official. Gurgaon's segment comprising Sectors 81, 82, 83, 85, 89, 90, 91 and 92, carved under a new master plan, are strategically placed close to NH-8, IGI airport, Reliance SEZ, and the proposed Metro link and Kundli-Manesar-Palwal (KMP) Expressway. A large number of property options are coming up along this route, which is well connected to both, Delhi and Jaipur. Developer interest has triggered fresh demand in this region, with prominent builders like DLF Ltd, Raheja Developers, Orris Infrastructure Pvt Ltd, Ansal API, Vatika Group, among others, active here. Many are township properties with multiple options of highrise apartments, single floors and villas. Some commercial properties are also taking shape in these integrated developments. A significant reason for developer interest in these sectors could be the presence of industries on the periphery, at Manesar and Dharuhera. Malls and entertainment zones are already present in Manesar, which is close by. Ashwani Sareen, assistant vicepresident (sales and marketing) of Orris Infrastructure Pvt Ltd, says these sectors are fast becoming the preferred destination, as there is access to transportation and infrastructure in the region, which will facilitate easy access to Gurgaon from the national capital and also from other neighbouring states. "The Jaipur-Delhi National Highway, the Delhi-Gurgaon eight-lane expressway and the Delhi-Gurgaon Metro rail connectivity has added several dimensions to the significance of Gurgaon as a commercial and residential destination," Sareen says. Ramstan of Ramstan Realtors says that two years ago, no one was interested in going to New Gurgaon as buyers were not sure about the future prospects of this area, but, whoever invested at that time have hugely benefited. He said: "Now, it has become one of the most sought-after places for investment. It is well-connected with all the three highways — NH-8, Dwarka Expressway and the proposed KMP Expressway." Some key projects in New Gurgaon are Alpha G Corp's Gurgaon One (Sector 84), Vatika Group's Gurgaon 21 (Sector 83), Ansal API's Fernhill (Sector 91), Bestech Group's Park View Ananda (Sector 81), DLF Ltd's New Town Heights (Sectors 86, 90, 91), Orris Infrastructure's Carnation Residency (Sector 85), among others. Among all these sectors, Sector 92 has seen the maximum increase in capital value of apartments, by 10%, in the April-June quarter of 2011 compared to January-March quarter. Sector 85 follows, witnessing an increase of 9% in the same period. The capital value of apartments in these sectors starts from Rs 2,500 per sq ft and goes up to Rs 5,400 per sq ft.
Sareen says that people who are looking for a good life away from the hustle and bustle of the city can opt for these sectors. "With the growing number of lifestyle townships and retail hubs, the destination is definitely attracting prospective buyers and also, it's an added advantage for the residents of the location," he says. GURGAON: After the national capital got a number of signal-free junctions, now it's the turn of Gurgaon. The first such junction will come up near Pachgaon in Manesar where the under-construction KMP Expressway crosses over the National Highway 8 (NH-8). Once completed, this will improve the connectivity between NH-8 and the expressway and commuters will have the option to move along in any direction seamlessly. According to NHAI sources, the interchange design was prepared by the Haryana State Industrial & Infrastructure Development Corporation (HSIIDC) and later approved by the authorities after some necessary changes were incorporated. The interchange design was reworked considering the expected increase in traffic flow and vehicular movement at this junction. NH-8 between Gurgaon and Jaipur is now being widened to six lanes. HSIIDC officials said that the revised project, with an estimated investment of Rs 100 crore, will have four clover leaves that will ensure swift movement of traffic from NH-8 to the expressway and vice versa. "Work will start soon as we plan to complete this interchange by the time the expressway becomes operational. It will be an urban infrastructure marvel with proper landscaping," said a HSIIDC official. A rainwater harvesting unit is also being planned along with the interchange. He added that while the main flyover across NH-8 will be of six lanes, the four clover leaves will be of two lanes. Sources said since the interchange would not be completed before the opening of the first stretch between NH-8 (Manesar) and NH-2 (Palwal), which is likely in the next couple of months, a traffic light would be installed on the highway temporarily. "We expect a lot of traffic heading towards NH-2 from Jaipur to take a right turn from here. But the red light is temporary and would be removed later," said an official. The 135-km-long KMP expressway has already missed several deadlines. Only recently, the Haryana government had extended the deadline for the first phase. The expressway touches four national highways – NH-1, NH-10, NH-8 and NH-2. The interchange will be a crucial point considering the fact that HSIIDC plans to develop a huge convention centre and exhibition hall near it. NH-8 also acts as the sole link between the industrial township of Manesar and the devoloping region of Bawal near Rewari. The planned convention centre is being projected as the future Pragati Maidan of NCR. This is likely to attract huge number of domestic and international visitors. The stretch called New Gurgaon is the closest in terms of proximity to Dwarka and West Delhi once the Dwarka Expressway will be operational. It is also close to the international airport. The remaining stretch towards Manesar will also see improved connectivity going forward. Land had been acquired at low prices by developers and hence this stretch saw a lot of developments launched in the affordable to mid-sized market segment of residential housing. In fact, these areas are now emerging as the answer to the question of what will fill the gap for mid-income housing demand that is not being adequately addressed in Gurgaon. Gurgaon has been diverted to this region. With prices being similar to those for developments in Noida, New Gurgaon has the potential for providing competition to Noida. The area witnessed a peak during the middle half of 2010. However, as things stand, a generic price rise of between 15 per cent and 20 per cent has dampened demand from price-sensitive buyers, and project-level sales volumes have dipped. If prices do not move further upwards, this region will lose its advantage of being an affordable residential zone. The rates were in the range of Rs 2,300-2,400 per square feet and have now reached a high of Rs 3,300-3,550 per square feet. The development of the Dwarka Expressway and other infrastructure initiatives announced by the authorities may bring about further price rises in future. As of now, new projects being launched at the higher price levels are unable to achieve appreciable sales figures. It reflects the fact that the consumer eyeing this location is extremely price sensitive. Going by the huge demand for homes in New Gurgaon less than a year ago, it can be said that this region will only regain actual residential property absorption at price points at least 20-25 per cent lower than current levels. This is a clear signal for the developers. The need to have an access road that would connect Udyog Vihar to the Delhi-Gurgaon expressway somewhere close to the existing toll plaza got a fresh impetus following a study conducted by the Millennium City Welfare Society. According to the study that has already been submitted to NHAI and Gurgaon traffic police, if this access is granted, not only would the toll collection increase by Rs 20 lakh a month but also over 2,300 liters of fuel can be saved daily, amounting to Rs 42 lakh every month. The study aimed to reduce traffic idling at the existing toll plaza also states that around 3,750 commuters, who come from Delhi via toll road in the morning, take an alternative route (via Kapashera) in the evening on their way back just to avoid the traffic snarls at the toll plaza. It also claims that as many as 87% of these people are willing to switch to the Delhi-Gurgaon expressway and pay toll on the proposed route if direct access was available from Udyog Vihar. The study was conducted in two phases. The first phase estimated the total traffic volume at the toll plaza, by recording vehicle counts over multiple days and timeslots. The second phase was conducted to assess if commuters who are currently taking Kapashera route in the evening would switch to the expressway. ridges (FOBs) or subways, despite heavy movement on both the sides. Instead, the Haryana Urban Development Authority (Huda) will ensure zebra crossings on various intersections, erect iron fencing on the median of the road as well as between the main carriageway and service lane. This fast stretch between Rajiv Chowk (on Gurgaon Expressway) and Badshahpur will cut across the Southern Peripheral Road (SPR), on which many high-rise residential and commercial structures are coming up. Mahesh Bansal of Green Ville, Sohna Road, said both sides of this road have dense population. Besides, they house residential buildings, malls, multiplexes and market places. “This is a fast stretch with heavy vehicular movement on both the sides. Trucks and dumpers loaded with construction materials like boulders are the most dangerous. Many a times, pedestrians have been run over by these speeding vehicles. We need subways or foot-over bridges. We can’t walk long to use zebra crossings,” he added. Defending its stance, Huda administrator Nitin K Yadav said no developed city road across the world has had crossover options like flyovers, foot-over bridges or subways. “Residents use zebra crossings. Each intersection on Sohna Road will have zebra crossings, with traffic signals.” Huda has paid R13 lakh to the CRRI for suggesting design for the road. However, the contractor of SPR will construct a flyover or interchange at the intersection of Sohna Road, but this will primarily be used by vehicles. Simirin Singh, an IT professional working in Manesar, travels from Dwarka every day. He hates the long commute and cannot wait for work to be completed on the Northern Peripheral Road (NPR) as it will reduce his commute time to half. Snighadh Sharma, another IT professional working in the same area, has invested in one of the housing projects coming up along the NPR. While he bought the apartment a year ago for R2800 per sq ft, prices have now jumped to R3200 per sq ft after the contract to construct the NPR was given to Indiabulls earlier this year. It will also be interesting to see how prices will move once construction progresses along the 150-metre wide and the 18-km-long NPR. Once that happens, it will not only be a major direct link with Delhi (from Dwarka side) alongside NH8, but will play a major role in redefining the real estate dynamics of Gurgaon. Interestingly, projects that were going at R3600 per sq ft along the NPR before the contract was granted, shot up to R4500 per sq ft soon after the financial bids were opened. Going forward, as construction for the NPR progresses, residential sectors along this road are likely to see a spurt in prices due to the favourable location . Clearly, the effect on land values is expected to be similar to the impact NH8 had on property prices in areas close to it once it became operational. “There has already been a run-up in valuation, at least 20% since January and in certain cases 35%,“ points out Anckur Srivasttava of GenReal Advisers, adding one can easily expect a 30% increase in prices in the next 12 months for a decent location, developer and real progress on the site. According to the new Gurgaon Master Plan, about 50 new sectors are to come up along the NPR stretch, which will include residential, commercial and institutional development. These are likely to comprise of almost 10,000 residential units. Some of the residential sectors that face the expressway include 113, 111, 110A, 110, 105, 104, 102, 99 and 37 D, among others. Besides, there is the commercial corridor which could throw up a supply of more than five to six million sq ft of office space over the next few years, and the NPR would facilitate faster access. The NPR will also lead to the SEZs planned to be built near the Gurgaon, Pataudi road, Manesar, Dharuhera and beyond. The NPR is seen to have more potential than NH8 because it is linked to the growth story of Delhi. The first sector is barely 4 kms from Delhi's international airport. The expressway will also connect the 100-metre and 80-metre urban express roads under the Delhi Master Plan 2021. The confluence zone is likely to fuel construction of premium housing in the catchment areas. A diplomatic enclave is also proposed in the new sectors of Dwarka, barely a kilometre away from the zone being allocated for farmhouses. At present, properties command prices of R8000 to R10,000 per sq ft on the Golf Course Road and R5000-plus per sq ft on the Extended Golf Course Road. The current price range of some projects launched in this belt is currently starting from R2600 to R3000 per sq ft. This price band caters primarily to the mid-segment along the NPR stretch, though villas, too, are on offer here in the range of R1 crore plus. are less than R50,000 per sq yard. In sectors 99 and 106/109, prices hover around R45,000. These rates are almost at two third discount. The company has 106 acres in Sector 99 and 153 acres in sector 106. “If new infrastructure is put in place ahead of demand it can open up a lot of land that can be developed and rationalise the prices. Once the road is up and running, there is no reason wh prices will not be doubled,“ points out Prakash Gurbaxani, MD and CEO of QVC Realty. Earth Copia, a project by Earth Infrastructure, located barely half a kilometre from th NPR, is coming up with semiluxury apartments in Sector 11 at a rate of R4150 per sq ft.“ Th prices along the stretch are expected to appreciate by 4050% in the coming two to three years,“ says Vikas Gupta, direc tor, Earth Infrastructure. Drawing inspiration from the national Capital, the integrated mobility plan prepared by the Department of Town and Country Planning (DTCP) for Gurgaon envisages a major shift to public transport by 2031, when the population is estimated to touch the 43-lakh mark. 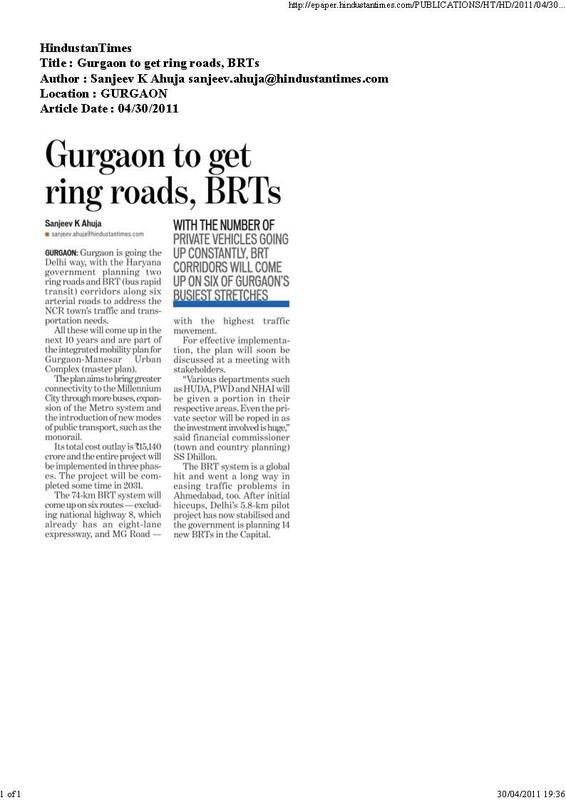 By the next decade, Gurgaon will have a ring road, outer ring road and 74 kms of bus rapid transit (BRT) corridor which is expected to be ready by 2016. Keeping in tune with the growing population and traffic volume, the vision document plans a major revamp to strengthen the road network. According to the senior town planner, the report has been approved by Haryana Urban Development Authority (Huda) administrator Nitin K Yadav and is in the implementation stage. According to figures released by the department, only 33% residents will depend on private transport 20 years from now, as compared to 82% at present. With an aim to reduce traffic congestion on city roads, authorities hope to increase use of public transport, mainly bus commutes, from the present 4% to 61%. With a total cost outlay of R15,140 crore, the plan has been divided into three phases – 2009-16, 2017-2021 and 2022-2031. Those wondering the need for a BRT corridor in Gurgaon, where only a handful of buses ply, may be pleasantly surprised with the government's plans. It is proposed to have bus stops at every 500m on the highways and after one-kilometre distance for other areas to support the 300 new buses which will hit roads under the ambitious project. Plans are afoot to allocate appropriate parking stands for autos near Fountain Chowk, Iffco Chowk, MG Road, Vishwakarma Road and Railway Station Road. Separate bicycle lanes of about 210 kilometres are also part of the project. 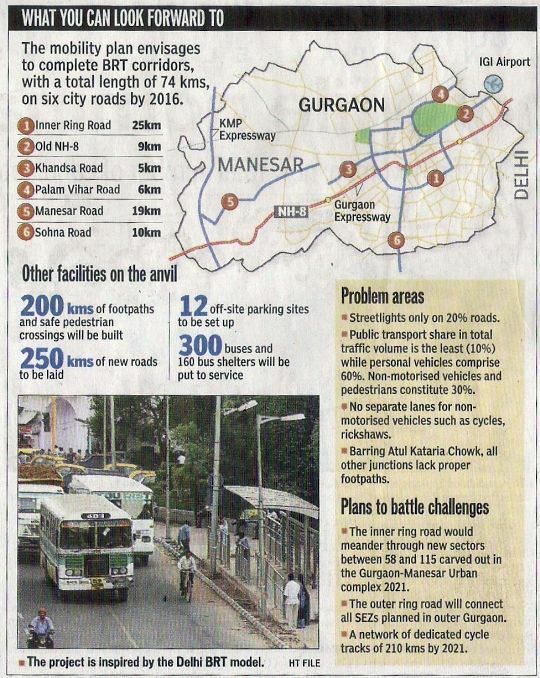 To counter traffic chaos due to unauthorised parking along roadsides, the department plans to set up a dozen parking sites near MG Road, Vishwakarma Road, Sector 29 (near Kingdom of Dreams), Sector 15 (Mini Secretariat), Cyber Park, bus terminal site, sectors 10, 43, 48, 47, 52 and Huda City Centre. Gurgaon-Manesar Urban Complex (master plan). The plan aims to bring greater connectivity to the Millennium City through more buses, expansion of the Metro system and the introduction of new modes of public transport, such as the monorail. Its total cost outlay is R15,140 crore and the entire project will be implemented in three phases. The project will be completed some time in 2031. The 74-km BRT system will come up on six routes — excluding national highway 8, which already has an eight-lane expressway, and MG Road — with the highest traffic movement. For effective implementation, the plan will soon be discussed at a meeting with stakeholders. “Various departments such as HUDA, PWD and NHAI will be given a portion in their respective areas. Even the private sector will be roped in as the investment involved is huge,” said financial commissioner (town and country planning) SS Dhillon. The BRT system is a global hit and went a long way in easing traffic problems in Ahmedabad, too. After initial hiccups, Delhi’s 5.8-km pilot project has now stabilised and the government is planning 14 new BRTs in the Capital. GURGAON: Get ready to commute in swanky low-floor buses in Gurgaon from this weekend. The Haryana Urban Development Authority (HUDA) and transport department will start an inter-city bus service in Gurgaon. The bus-service will cover several HUDA sectors of the city. Earlier, the plan for a bus service was gathering dust in a government department even though the HUDA had shelled out Rs 6 crore to the transport department in 2007 to make this project a reality. After a delay of over four years, the project will finally roll out in the city from April 30. The buses service will start at 6 am and continue till 10 pm every day. The transport department has drawn ten CNG buses (AC and non AC) from its fleet of inter state buses for the new Gurgaon sector bus service. "The buses will provide better connectivity within the HUDA sectors including the DMRC stations. The inter state city bus service will start from this weekend," said Nitin Yadav, HUDA, administrator, Gurgaon. The HUDA and transport department has chalked out the route the inter-city buses will ply – they will start from the bus terminus in Old Gurgaon and terminate in the same place after covering different sectors. The trial run for the bus service was carried out last week in which Yadav took stock of the situation. "It took one and half hour to complete the route which had been decided during the trial run of the intern city bus service. The route has been decided to make sure that the buses will be covering a large area," said Yadav. Areas which fall on the route of the inter city bus service are IFCCO Chowk, MG Road, Sikanderpur, Shankar Chowk, Golf Course Road, Sector 56, Ardee City Road, Sohna Road, Rajiv Chowk and then back to bus terminus in the Old City. The fare of the bus would determined as per the rules of the state transport department. The minimum fare will be Rs 5 while the maximum would be Rs 20. All the bus passes and ticket exemptions will be as per the transport department and the Haryana government. private rapid metro (DLF). What are the other projects in the pipeline? We have identified a mass rapid transit system (MRTS) for Gurgaon-Manesar-Bawal as an 'early bird' project, under the Delhi-Mumbai Industrial Corridor (DMIC) initiative. The feasibility study is on. Another project, in collaboration with the Centre, has been proposed for Panchgaon Chowk, near Manesar. Besides, Haryana State Industrial & Infrastructure Development Corporation Limited (HSIIDC) plans to develop an Industrial Model Township at Roz-ka-Meo in Mewat, 25 km from Rajiv Chowk. The hi-speed Metro project (Gurgaon-Dwarka) is likely to cost about Rs2,500 crore and the DMRC chairman had clarified that Haryana will have to bear 50% of the cost. Is Haryana ready for it? We will take a decision on this matter only after talks with the DMRC, Delhi government and other stakeholders. Have you chalked out any time-bound plan to address the civic issues that Gurgaon has been facing? kar Chowk) to Sector 55/56 is being upgraded at Rs347 crore. The total length of southern peripheral road (SPR) from Faridabad to NH-8 is 14.38 km, of which 2.17 km from village Ghatta to Faridabad will be completed by May. The SPR will be made functional by December 2011. Work on the stretch from Sohna Road to NH-8 is also in progress. When can we expect the NCR water channel to be ready for Gurgaon? The NCR channel will be operational by April 30. But the storage tanks at the tail-end of the channel, meant for supplying water to Gurgaon, being constructed by the HUDA, might not be completed by the same date. In Gurgaon, there is hardly any control on the opening and closing timing of liquor vends and bars. Any plan to regulate the activity and implement the Excise Act in true spirit? Bars in hotels or restaurants below 4-star category remain open till midnight. Their timing can be extended by two hours on payment of Rs5 lakh annually, in addition to the annual licence fee of Rs5 lakh. The additional fee acts as a deterrent. The excise department has also been conducting checks. Similarly, retail liquor outlets are also subjected to regular checking. I assure you that intensive measures will be taken to implement the Excise Act and the state policy in true spirit. Residents of Gurgaon, where one vehicle is stolen every four hours, have complained about active parking mafia. They say there are unauthorised parking lots all over who charge at will – with no administrative control on them. Would you intervene? All parking lots in Gurgaon are being run by parking owners, with the permission of the administrator, HUDA, commissioner and the Municipal Corporation of Gurgaon (MCG). The parking fee is fixed by HUDA and MCG. Neither any illegal parking fee is charged by the owners, nor an unauthorised parking mafia is active in the commissionerate. As far as vehicle theft is concerned, 12 gangs engaged in the crime have been busted during 2010-11. Is the DHBVN prepared to face the summers? Dakshin Haryana Bijli Vitran Nigam (DHBVN) has got into the act of ensuring uninterrupted power supply in Gurgaon during summers. The city requires 160 lakh units a day and the existing infrastructure is adequate. As per plans, about 50-km line conductor has been replaced, more than 90% 11KV feeders have been maintained and the rest will be completed by April 30, 2011. GURGAON: Gurgaon could soon get a commerce college in Sector-51, which would be modelled on the lines of Sri Ram College of Commerce of Delhi University. This was announced by Haryana CM Bhupinder Singh Hooda at the Vikas Rally organized at Badshahpur on Sunday. Hooda announced several other bounties for the city and its adjoining villages which would be rolled out in the near future. The CM said that the commerce college would be named after freedom fighter Rao Tula Ram. Considering the crucial role of voters in unauthorized colonies in the ensuing municipal election, the CM said that decision regarding regularization of unauthorized colonies in the state would be taken soon. Hooda said that there is a plan to start Metro rail service from Gurgaon to the Indira Gandhi International Airport via Dwarka. The detailed project report for this has already been forwarded. With the commencement of this Metro route, the facilities of check-in would be available to the people coming from the various parts of the country and abroad, he said. The CM also said that there was a plan to extend the Metro service from Gurgaon to Manesar under the Mass Rapid Transport System project announced by the Central government. Hooda said that the state government was in favour of constructing a bridge at the Hero Honda Chowk crossing on Delhi-Gurgaon expressway and the departments concerned have sought sanction of the Centre for this. Though, as per norms, such an expense is borne by the Centre, to redress the grievances of people at the earliest, his government has proposed to pay for 25% of the cost. Listing out the infrastructure augmentation plans, the CM said the widening of Golf Course road and construction of flyover between Shankar Chowk and Sikanderpur has already been awarded to DLF. He added that a feasibility study would be taken for a flyover at Subhash Chowk. He also announced projects worth Rs 347 crore for development works in 30 villages of Badshahpur, which fall under the municipal corporation. Hooda said that the work of widening and beautification of the major road from Palam Vihar to Delhi via Bajghera has also been awarded and it would cost Rs 296 crore to the government. This is likely to benefit the commuters on the Gurgaon-Rohtak stretch via Najafgarh. Gurgaon, one of the most revenue rich zones in Haryana, has emerged as a city of dreamers and while the capital city has reached a saturation point in terms of real estate development, Gurgaon is now a top destination for developers and investors. Reason: proximity and good connectivity to the capital city and the IGI airport. Why should one go to Gurgaon? Navin M Raheja, the MD of Raheja Developers Limited, says: "The area along the NPR (northern peripheral road) holds a great potential in terms of investment due to its proximity to the IGI airport and Delhi, and would provide excellent connectivity. This area is planned to be an upmarket area due to the proposed diplomatic enclave in Dwarka Phase 2, bordering Gurgaon, which would house all the major embassies. Investing in this region makes a lot of sense." Once a small farming village located close to south Delhi, Gurgaon now occupies the pole position in investments and employment generation and is one of the prime drivers of Haryana's development in the last two decades. And in this success story, the state government has played no small part with its favourable tax policies – the diligent efforts of Haryana Urban Development Authority (HUDA) have also put Gurgaon high on the table of infrastructure, which has been a magnet for developers eyeing the place for their projects. Sumit Bansal, the joint managing director of Innovative Infra Developers Pvt Ltd, says: "Some of the sectors that are seeing a tremendous response are Sectors 80, 81, 82, 85, 86, 90, 9, 92, 93 and 95. A very good aspect of this area is the proposal by the authorities to let the developers do the sector roads. Though nothing has been finalized on this aspect, if this comes about, then completion of sector roads will not be a problem here. Another factor is the proximity of these areas to Dwarka-Gurgaon link expressway, which will help the residents here bypass the traffic at Gurgaon toll near Delhi during peak hours. We have Legend Heights, a commercial project with 3 lakh sq ft prime commercial space with twin towers. It is strategically located in Sector 80 on the intersection of 270-metre-wide proposed 12-lane expressway, the NH 8, and the proposed 84-metre-wide Sector road. The mixed use development will include Grade A office space, an international upscale 140-room Hyatt hotel and worldclass retail facilities. This LEED gold rated project is designed by the Design Group, USA. Investment opportunity for office space starts at Rs 40 lakh and is being offered at a 70% discount for completed projects and is estimated to provide a 20% annual capital appreciation over the medium term. The project is currently under development and will be delivered by January 2013." Navin Raheja adds: "We have many projects coming along the Dwarka Expressway or the NPR. The projects are Raheja Vedaanta and Raheja Vedas, in Sector 108, Gurgaon, Raheja Atharva and Raheja Shilas in Sector 109 and Raheja Navodaya and Raheja Sampada in Sector 92. There are many more projects lined up along this highway. The rates of these projects vary from Rs 2,675 per sq ft to Rs 4,175 per sq ft. They are a mix of 2, 3, 4, 5BHKs, presidential suites, penthouses and independent floors. The size of these units ranges between 1,100 sq ft and 5,500 sq ft, in all these projects. A few of the projects like Atharva and Vedas come fully loaded with modular kitchens and airconditioners. Right now, we are constructing six projects." Avneesh Sood, the director of Eros Group, says: "Gurgaon has also been lucky because it is strategically located. Being close to the Indira Gandhi International Airport, the city boasts of good connectivity to all major metropolises. This has given a fillip to the development of Gurgaon as the most prominent outsourcing and offshoring hubs in the country. In fact, the leading auto companies like Maruti Suzuki and Hero Honda put their manufacturing base in the city only because of the high potential and ample land to accommodate their huge plants in Gurgaon." Guru Bindra, director of Key Real Estate Consultant, says: "A large part of the city is dotted with modern structures, which cater to the aspirations of the nouveau riche. The city houses leading corporate houses in the country. Proximity to the national capital is an added attribute. The proposed unified authority for the NCR will support the telecom boom in the area with all cellphone and landline service providers treating the entire NCR as a single telecom circle. Serving the needs of modern, busy and challenging lifestyles, Gurgaon has become a preferred city for thousands of professionals who opt for the apartments and housing options here. Owing to the potential demand from NRIs and well-heeled customers, who consider it worth spending at a higher rate for luxury and high-end facilities, Gurgaon has caught the fancy of most of the developers. The multi-directional developments in terms of infrastructural and commercial activities have promoted residential segment, which ranges from affordable to high-end, lowrise to highrise houses; tall condominiums, sprawling penthouses and villas. The BPO and IT revolution in the area has supported high purchasing power." S P Yadav, a resident of Sector 15, says: "The city is definitely high on rentals, compared to Delhi, but given the amenities and facilities, people prefer to own a house in Gurgaon. The rentals may start with a ticket price of Rs 10 lakhs. The development of offices and residential areas has paved way for the development of commercial sector in the city." Old Gurgaon road is also seeing major development in terms of real estate. The developments in Gurgaon have not left untouched the peripheral areas – the suburbs of Gurgaon like Manesar and Dharuhera have been riding on the real estate boom in Gurgaon. The proposal from the ministry of urban development to extend the territory of the National Capital Region to cover larger parts of Haryana, Rajasthan and Uttar Pradesh has led to the emergence of these areas as centrally located hubs for real estate. Mool Chand Sharma, a realtor, says: "Customers and end users who buy into such residential property will have made one of the soundest investments. Gurgaon has it all, and in abundance, and will only flourish in the years to come. Gurgaon will always remain a jewel in the crown of Haryana. This is one of the areas which has shown an upward trend in the real estate prices. Construction of additional IT promotion parks and export promotion zones with residential facilities, along with highspeed connectivity and telecom will further boost Gurgaon's standing as a preferred destination for lifestyle living and commercial enterprise." The residential segment in select micro markets of the NCR like Gurgaon, witnessed unprecedented growth during the year with significant increase in rental and capital values, says a report by Cushman and Wakefield. Capital values in most mid-end locations have appreciated by over 20% annually, with Gurgaon registering over 36% increase in capital values. The report says that this can be attributed to the rising interest of end users, and the broader economic revival. With improvement in the job market, end users have become more serious about their purchase decisions and are evaluating better options. A similar trend was also reflected in the launch of several new projects in the high-end segment, which were earlier shelved during the economic downturn. According to PropEquity Research, the weighted average price of newly launched products during the crisis fell sharply, from Rs 2,742 per square feet (psf) in the third quarter of 2008 — when the financial market turmoil hit the global economy — to Rs 2,093 psf in the first quarter of 2009. The fall in the average prices was mainly due to the developers’ new strategy to launch low cost apartments in the affordable range. The strategy of launching apartments in the affordable range paid off and the market started picking up. The total sale volume in Gurgaon, which had fallen to 1,311 in the fourth quarter of 2008, jumped to 4,440 in the first quarter of 2009 and further to 6,624 in the second quarter of 2009, according to the data provided by PropEquity Research. This enabled developers to push the prices up. It went up in Gurgaon from a low of Rs 2,093 psf in the first quarter of 2009 to Rs 2,730 psf in the second quarter and further to Rs 2,867 psf in the third quarter. The fast recovery in the sector emboldened developers to launch apartments for the mid and high segment. That is why, according to Prop-Equity Research, the weighted average price of the new launched apartments in Gurgaon jumped sharply from Rs 3,481 psf in the first quarter of 2010 to Rs 4,340 psf in the second quarter of 2010. However, as a number apartments launched in the affordable range went up again, the average price came down to Rs 3,430 psf in the third quarter of 2010. Shveta Jain says: “In 2011, the overall residential segment across major cities of India is expected to continue to see a growth in demand.” However, this should put upward pressure on the prices. Jain says that despite the increasing demand and improving market sentiments, the large available supply is expected to keep a check on the capital values across cities. As the Indian economy is back on the growth path, job creation is likely to continue. In fact, economists say that the number of jobs that are going to be created are likely to accelerate if Indian economy continue to grow at over 8%. According to one estimate, the number of jobs that will be created in software and ITeS sector in 2011 will be over 1.50 lakh. Cities like Gurgaon will be directly benefited by such a huge job creation. Jain says that improved economic and employment outlook will boost residential demand in select markets. But as supply has also increased, consultants say that prices will be under pressure. Markets like Gurgaon, which have witnessed strong recovery with capital values reaching high prices points, are likely to see some correction in the coming year as significant supply enters the market. Another issue that will affect prices is the execution performance. According to PropEquity Research, execution performance will play a key role in price determination over the mid term (2-3 years). According to a PropEquity Research report, in the next four years, 87,000 housing units are proposed to be built by various developers. As against this, only 21,800 units have been built in the last three years. However, demand has also picked up. Against a total sale of 21,500 units between 2008 and 2010, developers have been able to sell 67,700 units from the supply coming between 2011 and 2014. Clearly, there is an oversupply of over 20,000 apartments in the system. A number of projects are being launched in Gurgaon’s Sectors 76, 82, 83, 84, 92, 103 and 108, in a price range between Rs 30 lakh and Rs 50 lakh. In the present special issue, we are providing detailed charts for all the projects in the region. In its report, PropEquity points out that there are a number of developers who have promised to build over 10,000 apartments each in the next three years — but their track record does not encourage confidence. However, on the demand side, consultants say that if the economy continues to grow at the projected rate of over 8%, there will be enough jobs created to absorb the supply. Besides Gurgaon, Faridabad has also emerged as one of the most sought-after regions for residential units. The completion of the Badarpur flyover and the extension of the Delhi Metro line to Badarpur, in particular, have added to the attraction of Faridabad. A number projects have been launched in this area. Apart from these two places, Dharuhera and Bhiwadi have also emerged as good alternatives to end users. GURGAON: The upcoming Haryana Urban Development Authority (HUDA) sectors in Gurgaon are likely to get better roads, sewer and water supply. The urban development body in Gurgaon has earmarked over Rs 1,000 crore to develop infrastructure, which is lacking in the old sectors of the city. that the budget for the infrastructure has been taken out from the Rs 5,246 crore that the authority had collected in the form of external development charges (EDC) from group housing societies and private builders in the past several years. The agency has now has roped in Tata Consulting Engineers (TCE) for planning an advanced water supply model for the upcoming sectors. The model for water supply in new sectors from 58 to 115 will be planned as per the futuristic population estimate in the region. The work on the project has started. The firm will decide the layout plan of the water distribution system in these sectors, said Haryana Urban Development Authority administrator Nitin Yadav. The agency has plans to develop over 60 sectors in Gurgaon. While planning the new sectors, Haryana Urban Development Authority officials said that they are focusing more on road, water and sewerage infrastructure. Yadav said, Physical infrastructures like roads, sewerage and water supply will be developed in sync with the existing infrastructure and for this the work of planning and designing have already started. In a recently filed affidavit in the Punjab and Haryana High Court, HUDA had claimed that Rs 5,246.18 crore had been collected from different builders and societies as EDC and these include the fees paid by developers who have got their plots and projects in the new area under the Gurgaon Manesar Urban Complex Master Plan. Of this, Rs 3,977.4 crore had been spent till September 2010. The HUDA administrator said that the external development charges collected has been spent on developing the infrastructure in the city. The unspent amount of the external development charges collected will be spent in a phased manner in the upcoming HUDA sectors. A core committee has been formed to monitor infrastructural spending in the city, said Yadav. He also said that a major chunk of the unspent external development charges has been earmarked for building water treatment plant at village Chandu Budhera. The water treatment plan will have 300 million litre per day capacity of water treatment to cater to lakhs of residents.